r A LI A NT I transmitter. Completely overhauled, excellent audition, factory wired. $200 FOB. KlWHL, 53 Rokehy id,, Waban, Mass. V ANTED: AN/TCC-3 units AM/632 and TA-219. lN GRC sets and parts; AN/GRC 3-3, 4, 5, 6, 7, 8, 9, 0, \ 9, 26, 27, and any others. All PRC, PRR, VRC, ~KQ, etc. All ARC sets, including AN/ARjC-27, 33, 34, St 44, 52, 55, 57, 58, 66, and 73. AN/ARA, AHNt 'ollîns, Bendîx Aircraft Sets, R-220, R-38S, R-390, l-m, SP-600. Military Test Sets AN/UPM, URM, JSM, SG, ARM, etc. M eta scope night viewing1 type quipment. AX.APR-9, 13, 14, 17, etc. Military equip* lent catalogs showing pictures and description of radio, adar sets, etc, We pay lop prices. Technical Systems \>rp.. 4 2W. 15th St., NYC 10011. Call Ed Cham] Collect. 5S-3, 3I2B-3, 32S-3, 516F-2, 30L-L All mint condition t S1650. Wffl ship prepaid. WAS BAU, 7424 Edith N.E., \ Ihiiquerqite, N. M.
TELETYPE MODEL 30A PRINTER. Tiny light weight mit (19 lbs). Has 28 type keyboard, 115 vac motor, md-of-line indicator, aluminum case. Excellent condition, fust the thing for portable operation and demonstrations. £90. 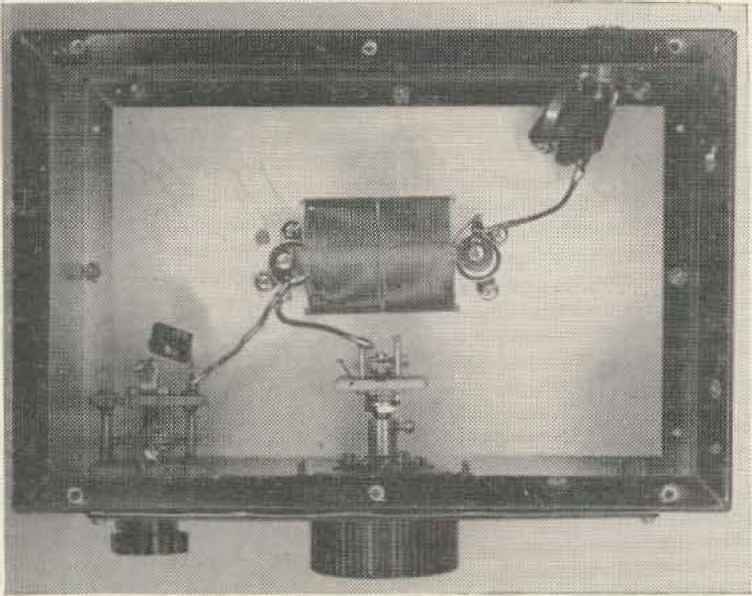 Box 152, 73 Magazine, Peterborough, N. H.
WIDE SCREEN TV CAMERA AND 18" MONITOR, Made by Crimson Color, Inc. Model 700. Sells for over $1000 new. Complete in excellent working condition. Like new with all cables, power supplies and manuals, $64 9. Box 153, 73 Magazine, Peterborough, N. H.
CLEANING SHACK. Low and medium power VHF transistors (other types also) at low prices. Send for listJack Pritchard, 4336 Livingston, Dallas, Texas, 75205. CASH, SONY TRANSISTOR TV's etc., swapped for G-R. H-P. L&N etc. laboratory equipment, special tubes, manuals, military electronics. ENGINEERING ASSOCIATES, 438 Patterson Road, Dayton, Ohio 45419. BANDS WITCHING table top CW KW : Pair of 4-250A's with matching VFO exciter- Professional construction. Must be seen. $275. Dave Allen WIWAI, 9 Upland, Burlington, Mass. POLY-COM 6 six meter transceiver for sale. Perfect—5 months old, $250. FOB, Write to VVB2POI William Goehcler, 124 North Sixth Street, New Hyde Park, N. Y. COMPLETE station, great for beginner. TBS-50D (50 65 watts), Elmac PMR-6A, Q multiplier. 6 meter converter, DO 04 tnikc, AR-22 rotor, SWR meter, plus VFO's, power supplies, junk, etc. Everything you need but the antenna. $161.25 P. Bice, 17 Wyman St., Worcester, Mass. Credit to Dr. Robert L. Carrel for his "Analysis and Design of the I jog-Periodic Dipole Antenna" was inadvertently omitted in the article "Design of Log-Periodic Antennas** by VE3AHU in the May issue of 73. Our apologies to Dr. Carrel. A few errors in the article "2m Beer Can Cavities'' by WA2INM in the May issue: First, the article's title is a bit off base and part of the text is irrevelant. The circuits described are coaxial circuits, not cavities. Also, point X referred to in the text is the link on coil L3. Point Y is the antenna input. Place the trimmer referred to in series with the antenna.